Thoughts turn to smoochin' once Toronto escapes the clutches of its winter prison. The newly summer-skinned brothers showing off tats and sisters in sundresses come charging through TTC turnstiles like glittering clouds of tropical fish into afternoons that wear the sun fiercely like a giant gold pendant. The heartbreak and heatstroke of August dog days still months away, now's the time to find that special sweetie 'n' head for the patios and there's no patio more likely to get you laid (patience, there'll be plenty of time for that) than the one in front of Julie's Cuban . Sinking quietly back from Queen Street's bustle, on a residential stretch of Dovercourt (across the street from Luna ), Julie's dwells in the shell of, and retains the erstwhile charm of a five and dime as fifties as any car roaming Havana streets and the patio feels more like having dinner in a friend's garden than sharing a stretch of sidewalk with pedestrian and automobile traffic. Romance hangs in the air heavy and still as the scent of lilacs and these nights sharing plates is less a culinary trend than like the company you keep: simply 'what's in season'. Besides it's getting way too sweaty and swoonsome to eat an entire meal without a little help. Beware though, as the worst kept romantic secret downtown, Julie's attracts a crowd of like minded doe-eyed soulgazers so if you haven't got reservations you and your honey should be prepared to dine elsewhere, Jackson. 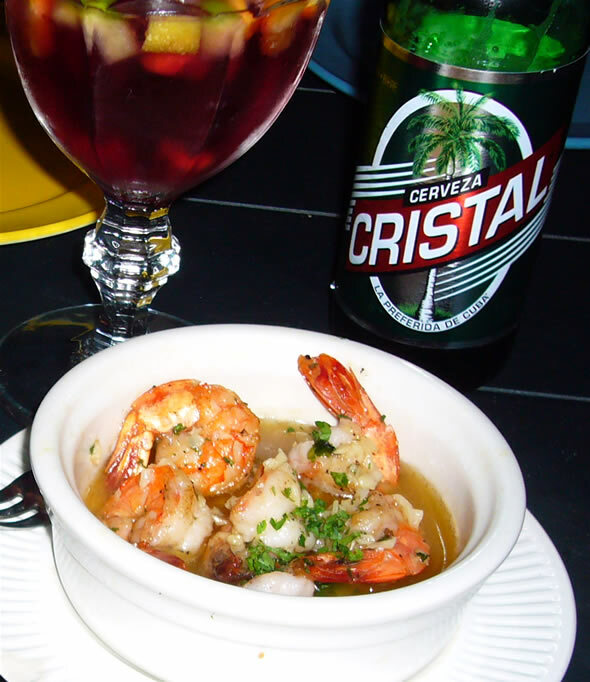 Since 'Cuban' is actually in the name, expect Julie's menu to offer a rich variety of Castro-less caribbean-inluenced tapas to suit any taste and easily squeeze out an evening's worth of dining. It doesn't matter where you start since its all yummy and the friendly wait-staff will happily stagger your selections, stretching out snacks well after the daylight dims and you've downed that third excellent mojito or split that second pitcher of above average sangria. Raw like a dirty weekend and equally yummy and over way too soon , the fleeting citrus-y ceviche arrives a small but lively mix of the day's freshest catch soaked in lime juice sprinkled with onion, colourfully crunchy bell peppers and coriander and sweet corn kernels on a leafy bed of lettuce that'll have you hesitant to share no matter how fond you are of you company. 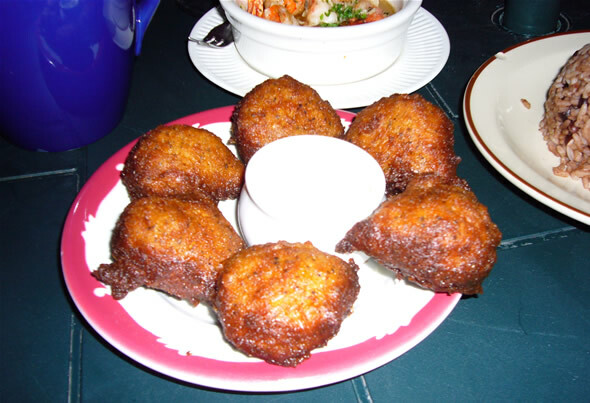 Expecting the Frituras de Mais (or Hush Puppies in the local currency) to sit in your gut and have you clambering for the nearest siesta cot would be a mistake as these mildly spiced, deep fried fritters are actually impossibly light pillows of corn batter served with a tangy hit of sour cream on the side. Papa Rellenas, a re-imagined Latin take on shepherd's pie are actually a variety of stuffings ranging from outstanding (peppery and tomatoe-y ground beef) to merely adequate (mushrooms and onions, cheese) engulfed in fluffy potato mash, then battered and deep fried and tabled as a crispy, golden, baseball-size (c'mon, it's their national sport) dumpling. A serving of sweet, garlic and wine soaked shrimp seems like the attire of Julie's patio patrons: slightly skimpy; and the guac merely takes up table space that could be better suited to the superior chorizo, braised with onion strings and red wine--soaking up that excess sauce is a cinch with a filling order of moros (the traditional Cuban side of black beans and rice). But the menu standout is definitely the Plantanos Especial. 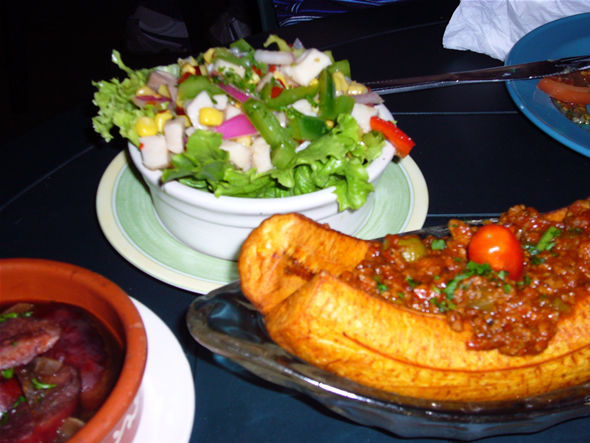 A sweet, soft plantain, halved and fried and stuffed with more succulent picadillo served in a banana split dish cheekily topped with a cherry tomato will delight more than anything on the desert menu. While nothing on the menu by itself will blow you away there's a strange alchemy at work at Julie's, where the bamboo and umbrellas, the twinkling Christmas lights and the quiet neighbourhoodly vibe conspire to fill your belly and your heart and make Julie's almost a perfect place to negotiate the deal . 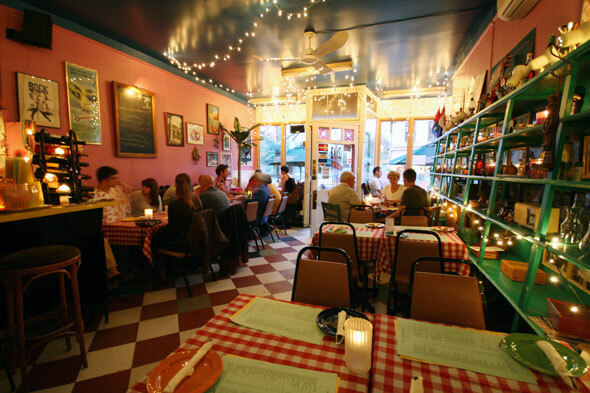 Let's face it amigo, if you don't get laid after a romantic patio-side dinner at Julie's you never stood a chance.